Dr Michael J Chusid, Department of Pediatrics, MFRC, Medical College of Wisconsin, 8701 Watertown Plank Road, Milwaukee, WI 53226, USA. An 11 year old Chinese boy developed a unilateral cervical mass associated with pronounced eosinophilia and a marked increase in IgE concentrations. A biopsy sample showed massive eosinophilic tissue infiltration consistent with Kimura’s disease. This disorder should be suspected when the clinical triad of painless unilateral cervical adenopathy, hypereosinophilia, and hyper-IgE is present, particularly in male Asian patients. Kimura’s disease is a chronic benign disorder, primarily seen in male Asians during the second and third decades of life.1 The major physical manifestation of this disorder is slowly enlarging subcutaneous masses, often in the head and neck area and usually in association with peripheral blood and tissue eosinophilia in combination with markedly increased serum IgE concentrations.1-3 Kimura’s disease is not often encountered outside the Orient, especially in young children, and thus many paediatricians are unaware of this disease entity. 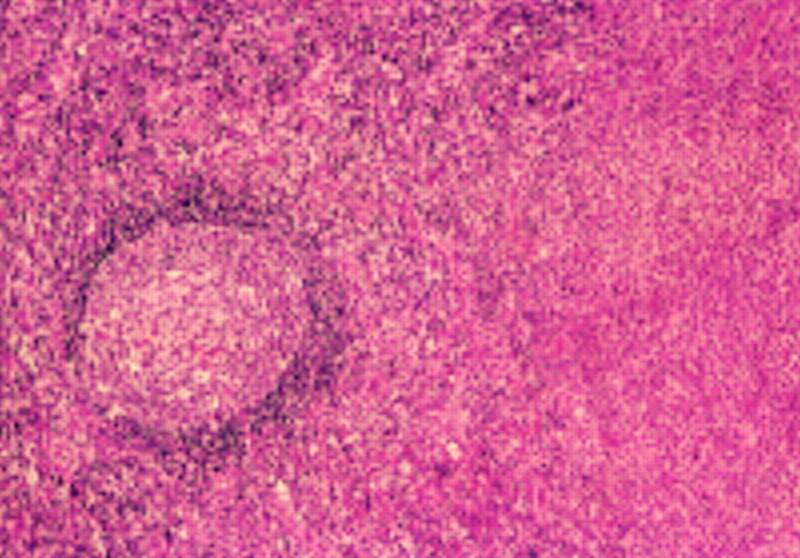 We have treated a young Chinese boy who presented at 8 years of age with an enlarging cervical mass and who was eventually diagnosed as having Kimura’s disease. The patient, an 8 year old Asian boy, had been in good health until one month before referral when his dentist noted a non-painful swelling on the left of his neck. Born in the USA of ethnic Chinese parents, he spent his second year of life in Taiwan. There was no history of recent febrile illness, pharyngitis, cough, rash, or diarrhoea. He had never received blood or blood products. Physical examination showed an apparently well boy with an obvious swelling on the left of his neck. A 3 × 6 cm, lobulated, non-tender, firm cervical mass, below and non-adherent to the left mandible, extending from the angle of the jaw to the middle of the neck anteriorly was palpated. The overlying skin was not inflamed. The following test results were obtained: haemoglobin, 128 g/l; white cell count, 9.2 × 109 cells/l (23% neutrophils, 42% lymphocytes, 3% monocytes, 31% eosinophils, and 1% reactive lymphocytes); and platelets, 214 × 109/l. A rapid mononucleosis assay was negative. Computed tomography of his neck showed prominent lymphadenopathy extending from the left lingual space to the thoracic inlet. The largest discrete mass was 2.5 cm in diameter. No necrosis nor calcification was noted. A chest radiograph was normal. Because of concern that the mass might be secondary to a neoplasm, a biopsy sample was taken. Microscopic analysis of this material showed the nodal architecture to be intact. Reactive follicular hyperplasia was present with prominent eosinophilia (fig 1). There was no evidence of malignant change. Subsequently, the IgG concentration was seen to be increased at 21.4 g/l (normal 5.98–12.05), as were the IgA (3.89 g/l; normal 0.3–2.0) and IgM concentrations (1.52 g/l; normal 46–70). The IgE concentration was markedly increased at 5281 μg/l (normal 30–280). Urine analysis was normal. The following titres were non-reactive: Toxoplasma gondii, rubella, cytomegalovirus, filariasis, Trichinella spiralis, Toxacara canis and catis, and Trypanosoma cruzi. Biopsy sample of cervical mass showing intact follicular architecture with prominent infiltration by eosinophils (haematoxylin and eosin, ×100). Based on the peripheral hypereosinophilia, histology, and negative serological testing for parasitic agents, a clinical diagnosis of Kimura’s disease was made. For two years the patient’s mass stayed approximately the same size. It then began to enlarge painlessly to a size of 8 × 10 cm. Because of the degree of physical deformity, a decision was made to attempt to resect the mass as completely as possible. Histo- logical examination of the removed tissue showed the same histology as previously noted: maintenance of nodal architecture with the presence of a mixed infiltrate of mature lymphocytes and a large number of eosinophils. Eosinophilic microabscesses were present with central necrosis. Ten months after surgery the boy remains well without any sign of recurrence of the tumour. The pathophysiology of Kimura’s disease is not understood at this time, but may relate to a disturbance in the normal rate of production of eosinophils and IgE, currently believed to be a product of an interaction between types 1 and 2 (Th1 and Th2) T helper cells. Such a derangement could result in excessive elaboration of eosinophilotrophic cytokines such as interleukin 4.7 Patients with Kimura’s disease have been shown to have high levels of circulating eosinophilic cationic protein and major basic protein, with heavy concentrations of IgE in their tissues.2 Allergic or parasitic aetiologies for Kimura’s disease have been actively sought, but not identified. Three major therapeutic options exist for Kimura’s disease. Resection of the tumour mass may be effective in permanently eradicating the mass if the entire lesion can be removed, but regrowth is common.2 3 6 Local irradiation has also been shown to be effective in shrinking lesions, but is generally not advocated in younger patients.5 6 Finally, systemic and intralesional corticosteroids have been shown to reduce the size of the lesion, but the tumour tends to recur when these drugs are discontinued.6 8 In selected patients it may be advisable to take a conservative approach, treating only if the mass continues to grow or causes significant deformity. Paediatricians need to be aware of Kimura’s disease, especially in view of the growing number of susceptible Asian children present in Western countries. Recognition of this disorder may allow doctors to limit the number of laboratory tests ordered and reduce concern about the possibility of malignant disease. Kimura’s disease needs to be strongly considered in any patient, especially an Asian boy, who presents with a painless head or neck mass in association with marked eosinophilia and hyperimmunoglobulinaemia E.
The authors gratefully acknowledge the assistance of Glauco Frizzera MD, Chair, Department of Hematopathology, Armed Forces Institute of Pathology, Washington DC, who reviewed our patient’s biopsy specimen. (1948) Unusual granulation combined with hyperplastic change of lymphatic tissue. Trans Soc Pathol Jpn 37:179–180. (1992) Kimura’s disease: clinical, histological, and immunohistochemical studies. Acta Med Okayama 46:449–455. (1994) Kimura’s disease: an unusual cause of head and neck masses. J Otolaryngol 23:88–91. (1992) Kimura disease involving parotid gland and cervical nodes: CT and MR findings. J Comput Assist Tomogr 16:320–322. (1994) Recurrent nephrotic syndrome associated with Kimura’s disease in a young non-Oriental male. Nephron 68:259–261. (1995) Treatment of Kimura’s disease: a therapeutic enigma. Otololaryngol Head Neck Surg 112:333–337. (1993) Relative contributions of human types 1 and 2 T-helper cell-derived eosinophilotrophic cytokines to development of eosinophilia. Blood 82:1471–1479. (1989) Radiation therapy in Kimura’s disease. Acta Oncol 28:511–514. (1995) Angiolymphoid hyperplasia with eosinophilia. J Laryngol Oncol 109:262–264.